As many of you may have noticed mtgpulse.net is now redirecting to mtgdecks.net but, why? The site was down suddenly like 2-3 months ago. For me was quite a surprise to see it banished from the net overnight. 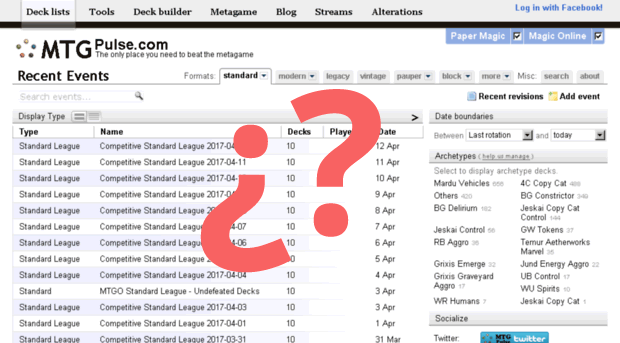 They have been publishing decks and tournaments for almost 7 years, and many times I have used them as a source for mtgdecks.net. It has been a valuable lost for the MTG community. I tried to contact the owner, but I got no answer so I was left wondering what could have happened (if you know a bit more about it I'll love to see it in the comments). After a few time, I saw that the domain was being auctioned in the secondary market, and I was lucky enough buy it back for a fair price. Now I'm redirecting all the tournaments, tools, and sections to the equivalent sections in mtgdecks.net. But there are many links that I don't now where were pointing exactly, so, if you find a broken link from mtgpulse.com that is being redirected to the wrong page, just tell me in the comments, and I'll try to fix it as soon as possible. I'll also love to know what tools from the original site are you missing, and I'll try to implement them in MTGDecks.net as soon as possible.